Oh, how I love having fun with tea logos. As I’ve mentioned before (see list below), a series of local artists have been creating logos for our house blends. Today’s new logo is for a tea that started out as a custom blend for my wife, Kathy. She is a chocoholic who loves tea. She has tried chocolate tea blends from various companies, and decided that she’s not a fan of chocolate tea blends using mild-flavored tea. She likes to be able to taste the chocolate and the tea. So we came up with a blend based on a loose-leaf shu (ripe) pu-erh blended with cocoa nibs (and a few other things). The result was so good, we decided to give it a permanent home on the tea bar’s menu. 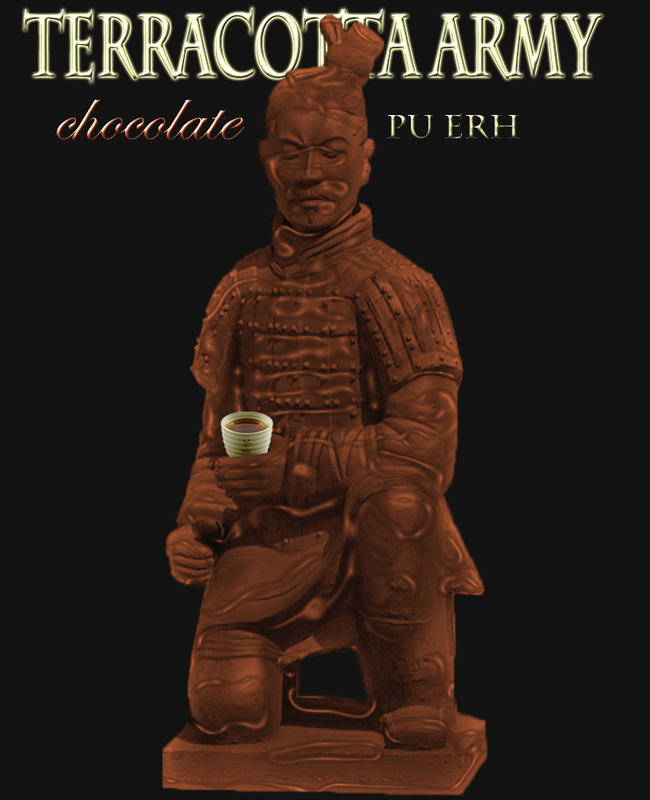 After struggling for a while to come up with a name reflecting its Chinese origins: Terracotta Army Chocolate Pu-erh. We love that Kory started with one of the soldiers in the real Terracotta Army, made him chocolate, and gave him a cup of tea. He actually provided two logos for us to choose between. We picked the one above because it is clear, simple, and easy to identify even at small sizes. I actually prefer the alternative (shown below), but it’s just too complex to put on a little tea label. The details are what really make this one. Note the eyes on the soldier above and left of the chocolate soldier. You can almost hear him thinking “Yummy!” The one above and to the right has a similar, but more subtle expression. It’s not obvious at first glance, but if you look closely, the soldier to the right of the chocolate fellow is holding a piece of the melted/broken chocolate arm in one hand, and a cup of chocolate pu-erh tea in the other. Thank you, Kory! Another awesome logo for the collection! Posted on 22 February 2013, in Styles & Blends, Tea Biz and tagged China, chocolate, cocoa nibs, earl grey, Kory Rountree, logos, Mr. 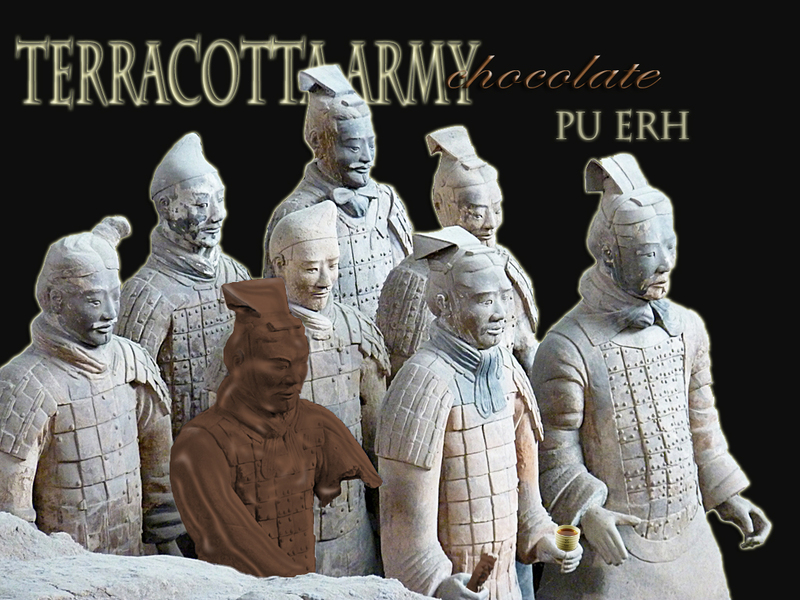 Excellent, pu-erh, terracotta army. Bookmark the permalink. Leave a comment.